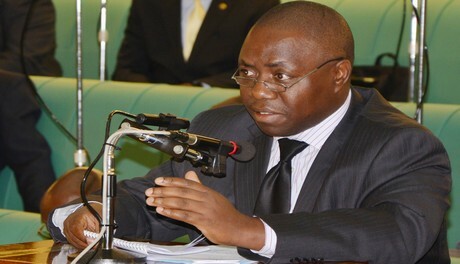 KAMPALA – The meeting between legislators on the Parliamentary Defence and Internal Affairs Committee and officials from the ministry of Defence ended unceremoniously after Members of Parliament (MPs) protested what they termed as arrogant conduct of Mr. Adolf Mwesige, the minister of Defence. Hell broke loose when some MPs put the minister to order after discovering that his presentation of the Ministerial Policy Statement for 2019/2020 for the army was not in tandem with the documents he had presented before the Committee. Despite pleas by the legislators to have Mr. Mwesige harmonise his presentation, their requests fell on deaf ears as the minister kept referring them to the different annexes entailed in his documents, actions the MPs found to be disrespectful. This prompted Kaps Fungaroo (Obongi County) who reminded him that the MPs on the Defence Committee are bosses to the minister because it is their role to provide oversight over the activities of the Ministry of Defence. The remarks were rejected by minister Mwesigye who sharply and repeatedly told the MPs that they have never been and will never be his boss at any one time, saying he is only answerable to the Commander in Chief and not Members of Parliament. Ms. Doreen Amule chairperson of Defence Committee calmed down the situation as she suspended the meeting for fifteen minutes before she finally adjourned the meeting and urged both the MPs and Mr. Mwesige to treat one another with respect. “I am requesting that as we treat others, we look at the bigger picture of the country and as such, we are all mandated to deploy our functions with respect to one another and mutual understanding for this Committee, I, therefore, adjourn the meeting,” Ms. Amule added.